Home Local News BREAKING NEWS: Carrefour Market on fire. BREAKING NEWS: Carrefour Market on fire. 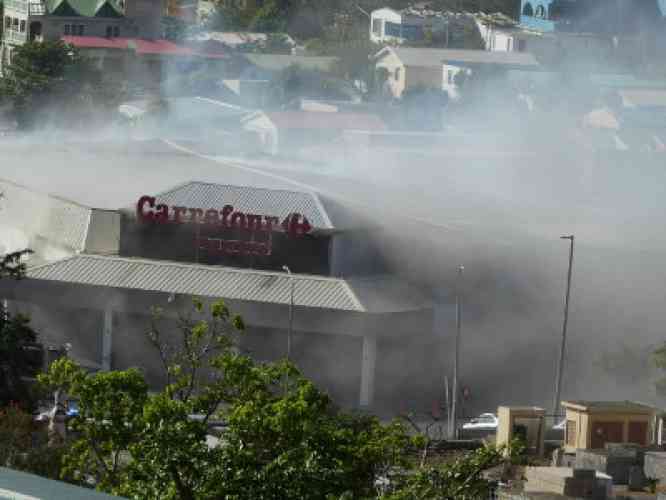 PHILIPSBURG:— Newly opened Carrefour Market is on fire which started around 7:30 am on Thursday morning confirmed police spokesman Ricardo Henson. The origin of the fire is unknown at the moment. Henson said traffic in the area of Bush Road had to be closed off as firemen battle the early morning fire. SMN News will bring your further information when it becomes available. Next articleCft chairman Raymond Gradus: “Discipline with financial management Bonaire is troublesome”.